Sometimes after a person has finished a complicated pattern where each yarnover and knit-together had to be kept track of and a careful count of which row of the pattern was being done, what's required is something simple. So that's what I did: something simple. For reasons completely unknown to me, the basketweave stitch in all its variations makes me happy. There's something comforting and homey about it, and it can look rustic or sophisticated depending on the yarn used. I chose the basketweave variation that I wanted and took out a couple of skeins of Craft Smart yarn in a colorway called "Sangria" that I bought at Michael's. This yarn is 100% acrylic and the combination of colors makes me smile. As I began to knit this scarf, I discovered that the yarn was bringing back some memories, too. As you can see in the photo, anyone who wears this scarf is not going to get lost in a crowd! Golds, pinks, lavendars, reds, oranges all combine for a Wow! statement, and that's just what I was looking for. The texture and colors of the scarf remind me of some handwoven placemats from Oaxaca, Mexico that I'd seen in a shop and had been too skint (broke) to buy. The colors also remind me very strongly of my Aunt Marguerite who absolutely loved to crochet the most intricate doilies in the most retina-melting color combinations that she could find. Bless her heart-- she wouldn't think the yarn I used was near bright enough, although she would approve of the red pony beads that I sewed on at the top of the fringe at both ends. What was I watching while making this bright beauty? 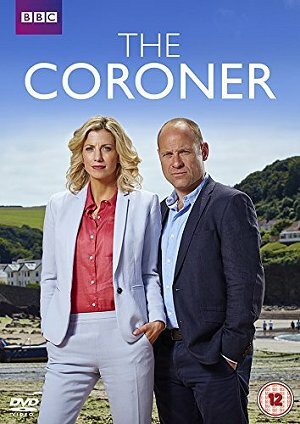 Our local PBS station has been showing episodes of a BBC series called The Coroner, which is set on the coast of Devon in England. Jane Kennedy has moved back to Devon, and she and her teenage daughter are living with Jane's mother and her partner, Mick, who runs the local pub. She's the coroner and has to work closely with Detective Sergeant Davey Higgins-- the boy who once broke her heart. The acting is first-rate, with Jane's mother Judith and publican Mick providing much of the humor. You see, they're much less serious than Jane, and they also happen to be quite the lusty pair. Jane's daughter Beth is a typical teenager-- you want to hug her to bits one second and shake some sense into her the next. The partnership between Jane and Davey doesn't always run smooth, but the periods of friction are smoothed out by a laugh or two. I am really impressed by the writing of the series. One episode in particular had me completely stumped, and the solution was quite mentally and emotionally satisfying. An added bonus with The Coroner is the seventh character: the county of Devon and its spectacular coastline. All those in charge of filming take full advantage of the scenery, and I lap up every scene. If you're in the mood for good acting, good stories, and gorgeous scenery, I hope you can get your hands on this series. I think you'll really enjoy it. Here's a link to the BBC website for the show which shows a video of some of the cast and crew talking about how much they love filming in Devon-- and you get to see what they're talking about. Enjoy! Oh, that does sound like a good show, Cathy. I'd heard of it, but not (yet) seen it. 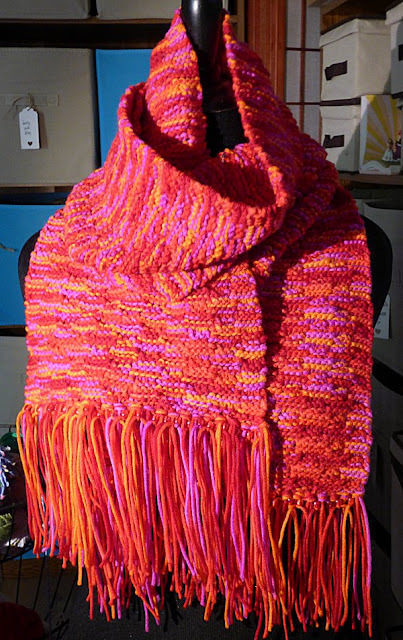 And that scarf is gorgeous - such rich, lovely shades, and it looks really soft, too. I think you'd really enjoy The Coroner, Margot. I hope you get a chance to see it. When you wrote about doing something complicated and then wanting to do something simple, it reminded me how after reading some books I almost feel like I have a book hangover. I want to read something light next. It doesn't mean that I didn't like the book but my brain feels tired after it. I remember one book The Calling featuring Hazel Micallef was very dark (for me) and I thought "I have to read something lighter" I read before I go to sleep and I thought I can't read that. So I found a book that was a light humorous mystery. I needed that. I did enjoy both books and did go on to read the next book in the Hazel Micallef series which wasn't as dark as the first one. I'm the very same way about my reading, Lynn! That scarf is beautiful. Love the colors. Whoever ends up with that piece of craftswomanship is lucky. I will check out The Coroner. Sounds good. I've been watching The Night Manager on dvd's from the library. Very well-done, but fast-paced, subterfuge, some brutality and a great cast. Hugh Laurie is the "worst man in the world." Yup. Thomas Hiddleston is the British spy and the terrific Olivia Colman of Broadchurch is the his boss in British intelligence. And, yes, I, too, must read something light after a heavy read. After I finished Fred Vargas' A Climate of Fear, which was a heavy read, I was so happy to get Sara Paretsky's latest book "Fallout" from the library. It's just fun. I'll have to keep an eye out for The Night Manager.